Garth Evans, Untitled No. 1, 1974, plywood. I admit that before walking into the Longside Gallery at the Yorkshire Sculpture Park last week I was woefully or rather shamefully unaware of Garth Evans’ work. The Arts Council Collection exhibition, Garth Evans, which closed this past week, rectified such ignorance. 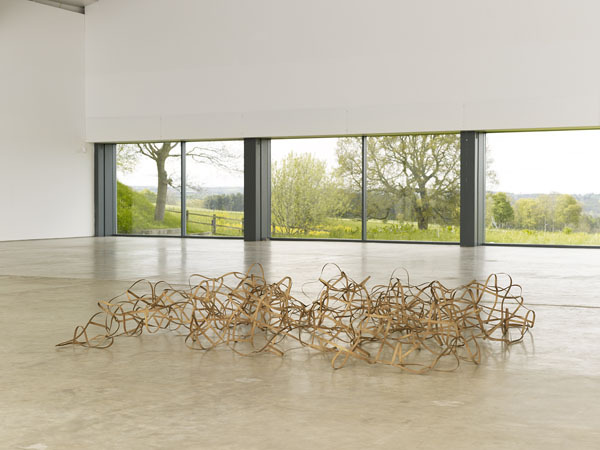 The first major show of Evans’ work in the UK in over twenty years, the exhibition reads almost like a primer of the major developments of sculpture in the 1960s. A student at Slade between 1957-1960, Evans did not begin his career with the ” New Generation” group that emerged around Anthony Caro at Central St. Martins and left to teach in New York by the time the artists loosely classified under the label New British Sculpture, including Richard Wentworth, Tony Cragg, and Richard Deacon, broke onto the scene in the 1980s. Evans’ work, however, influenced and was influenced by this especially rich and complex moment in the history of British sculpture. It only seems right that it was Deacon, a friend and former student, who served as the curator of an exhibition meant to re-situate Evans within this history. The work on view immediately struck me as significant; completely of its historical moment while still fresh and relevant in the contemporary sphere. Selected from the roughly first two decades of his career, the sculptures in the exhibition are diverse and include “student work” from the late 1950s and early 1960s that reference cubist constructions and Mondrian geometries, large free-standing fiberglass abstract forms, and colorfully coated, steel minimalist structures. A separate gallery has a selection of drawings and fantastic black and white photographs Evans took during his two year fellowship with British Steel, which focused on the material in a variety of forms and were included in the publication Some Steel. 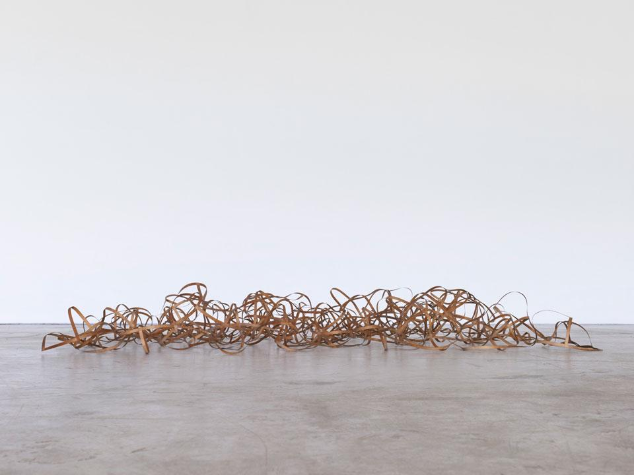 While Evans describes this period as frustrating in terms of producing work, it did result in a significant shift in his sculpture in the 1970s, most notably in regards to materials and their manipulation. Breakdown reflects this change and Evans’ interest in creating, as he states, a sculpture without creating an object. Using a lattice type approach, numerous pieces of narrow steel are joined together but are adhered in a manner that denies any clear or logically repetitious pattern. 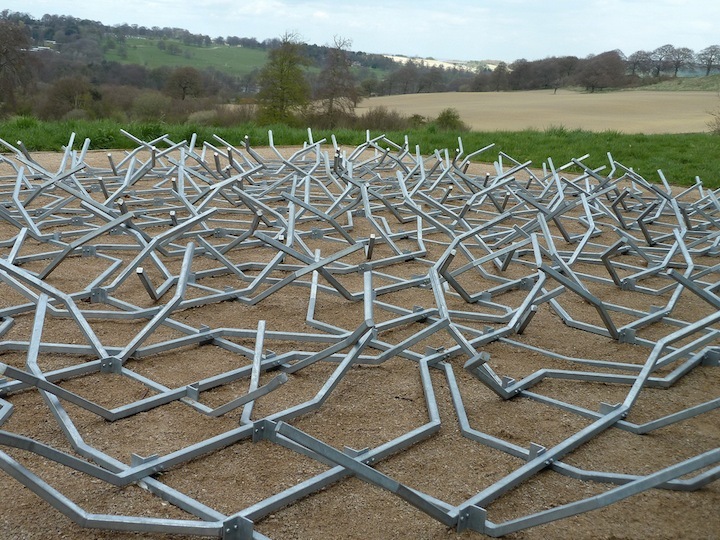 Though the original version was stolen shortly after its first installation in 1971, a new version was made specifically for this exhibition and installed outside the Gallery, amidst the rolling Yorkshire landscape that wonderfully counters the piece’s hard geometric angles. As Deacon suggests in the video below, works like Breakdown question where a thing ends. Garth Evans, Untitled No. 1, 1974. Arts Council Collection, Southbank Centre, London. Gift of the artist. 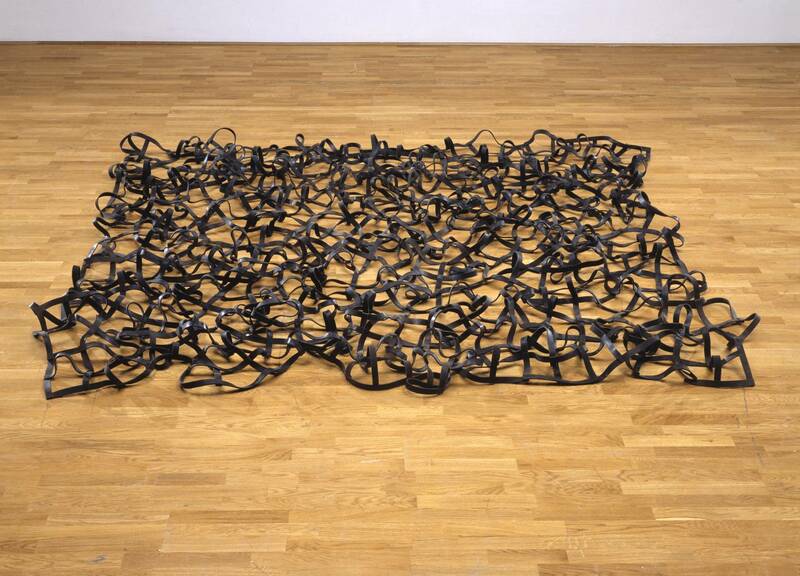 Evans’ exploration of horizontal orientations and “carpet” type forms that cover large expanses of space continued in his pieces from the mid-1970s. Untitled No. 1, 2, and 3 rely on similar formal strategies, and likewise reward sustained looking. Nos. 1 and 2 consist of thin ribbons of wood, the adhesive connecting the multiple joints barely visible. No. 1 has a lighter coloring and with its more pronounced elevation from the ground seems to hold greater volume, but both share an exuberant sense of movement and dynamism. They recall Richard Serra or Robert Morris’ process oriented investigations of rubber, felt, and lead, but Evans’ pieces refuse to be read as a lump of materials. They are not piles but structures, not crumpled masses but lyrical, organic material rhythms. Garth Evans, Untitled No. 3, 1975, rubber. Presented by the artist in memory of his father, Cyril Evans 2003. Tate, London. What becomes evident in looking at his sculptures from the 1970s is just how much attention and responsibility is given to materials. This becomes clear in comparing, for example, No. 1 or No. 2 with No. 3. All three works rely on a similar strategy of joining together small, thin pieces of material in an irregular grid type form. In the case of the latter, constructed with strips of black rubber, however, the connotations and effect of the work drastically alters. The fragility and lightness of the pieces made with wood is replaced by a sense of heaviness, the properties of the material unavoidably weighing the structure down. There is the implication of greater flexibility and the subtle sheen coming off the rubber evokes a completely different type of tactility, but the material specificities also alter the ability of the viewer to see through the work, collapsing the spaces in between into a darker, more chaotic mass. Garth Evans, Wedge No. 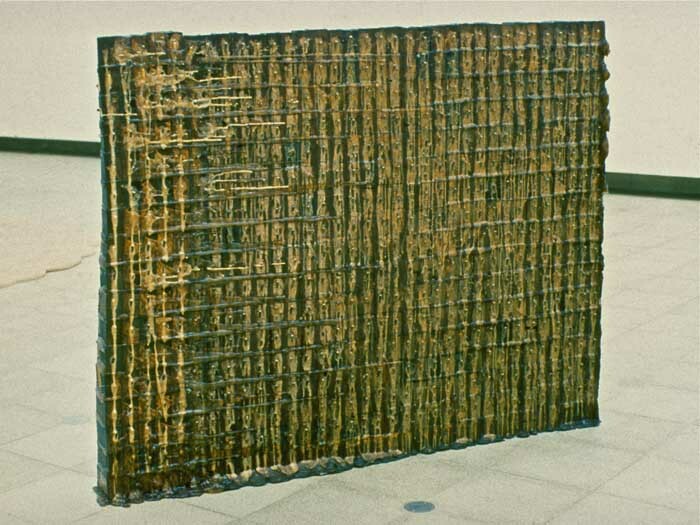 2, 1979, wood, 44 x 55 x 9″. Leeds Art Gallery. Evans’ engagement with materials is also highlighted in the fantastic Wedge II (1979). Like No. 1 and No. 2 it is constructed of wood and adhesive, but here the orientation is vertical, a solid if honeycombed monolith oozing with striated resin-like glue. Again making and movement are emphasized as its edges reveal the accumulation of adhesive and multiple ends; a physical trace of how the artist worked with gravity allowing the substance to move downward, pooling at the bottom, before being turning the piece to begin the process again. The light coming in from the large wall of windows in the gallery created an almost translucent effect, granting access into the interiors of the adhesive drips and surface below. The wood is both emphasized and obfuscated. The ability to make something both visible and invisible, to present something seemingly so simple that its complex nature is almost overlooked, appears as a signficant, if subtle, characteristic of Evans’ sculpture – work that was a revelation to me and which I hope will only continue to become more visible in the years to come. Garth Evans: An Arts Council Collection exhibition selected by Richard Deacon from Yorkshire Sculpture Park on Vimeo.